"I LOVED every word of your book. The book is unique and elegant--not a wasted word. Beautiful! Moving! Inspiring--deeply!" - Pamela Pomerance Steiner, Ed.D., L.M.H.D. "Norma's story, told with rich detail and lack of sentimentality, is a tribute to her fierce determination to heal her body and spirit. It inspires by way of her courageous willingness to embrace and acknowledge the truth of a life of pain and suffering, as well as, grace filled joys. In her desire to share her experience, she invites us to a life where everything matters. In the end, we are left with a deeper awareness of the Mystery of what is bigger than our rational minds can grasp." - Mary Jo Clarke, M.D. 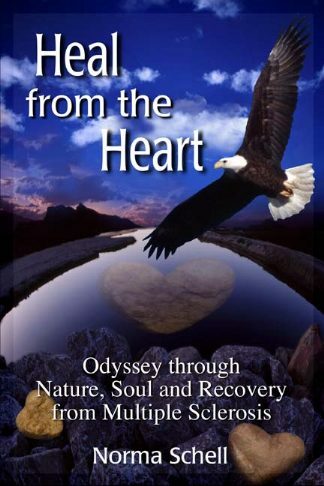 "Heal From The Heart is Norma Schell's inspirational and very personal account of how she courageously overcame multiple sclerosis and reclaimed her lost self. - Peter Herman, LL.B., M. A. "Norma has written a fabulous book about the trials of life, the challenge of growth and change, and her ultimate triumph to live a full life. Every word is packed with meaning. Her story sometimes made me cry, sometimes made me laugh, and throughout touched my heart and soul. For everyone, this is a book of inspiration and hope. It is a delight to read and I highly recommend it!" The images and words of this website and book may not be reproduced in whole or in part, by electronic or any other means which exist or may yet be developed, without permission from the author.